Peter Davison, The Fifth Doctor and the Master do battle over a shape-shifting android in these two classic 1980s adventures: The King's Demons, Planet of Fire and Planet of Fire Special Edition. England, March 1215. King John is visiting the castle of Sir Ranulph Fitzwilliam. 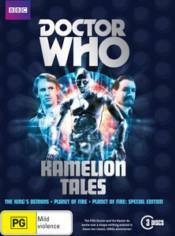 The arrival of the TARDIS disturbs a medieval joust, but the Doctor and his companions are proclaimed to be friendly demons by the King, who seems strangely interested in their �blue engine�. It soon becomes clear that neither King John or his Champion, Sir Gilles Estram, are who they pretend to be. One of the Doctor's oldest and deadliest enemies threatens the future of democracy on Earth, and he must be stopped! A strange signal from Earth draws the TARDIS to the island of Lanzarote, where Turlough rescues a young American girl, Peri, from drowning. Among her possessions is an artefact bearing an alien symbol � the same triangular mark that Turlough has branded into his arm.